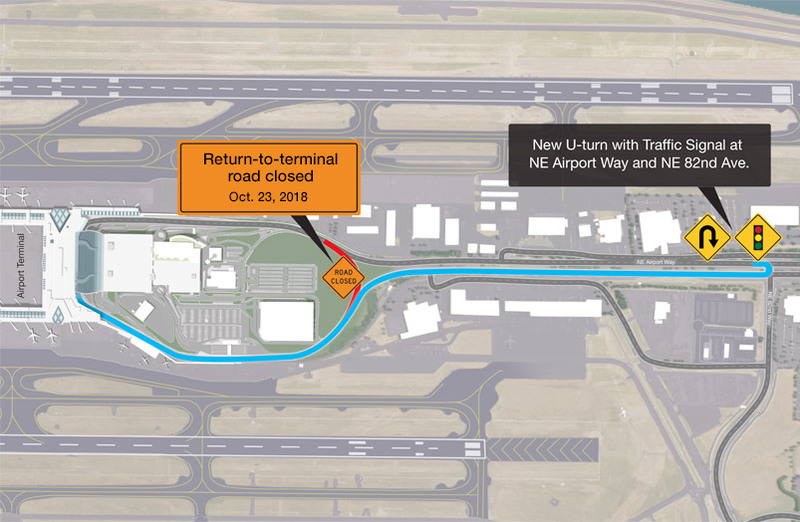 On Oct. 23, 2018, Portland International Airport opened a new return-to-terminal route for travelers headed outbound (east) on Northeast Airport Way. This new U-turn has a dedicated traffic signal at the Northeast 82nd Avenue intersection to make a driver’s return to the airport safer and easier. This roadway change is part of PDXNext – a program of improvements that will make the airport better for travelers, employees and airlines. The PDXNext improvements include an enhanced ground transportation system with less congested roads, more parking, and rental cars conveniently located within walking distance of the terminal for travelers’ convenience. The airport is committed to the many ways of getting passengers and visitors to and from the airport – and the high-level of customer service that will keep PDX running smoothly for years to come.